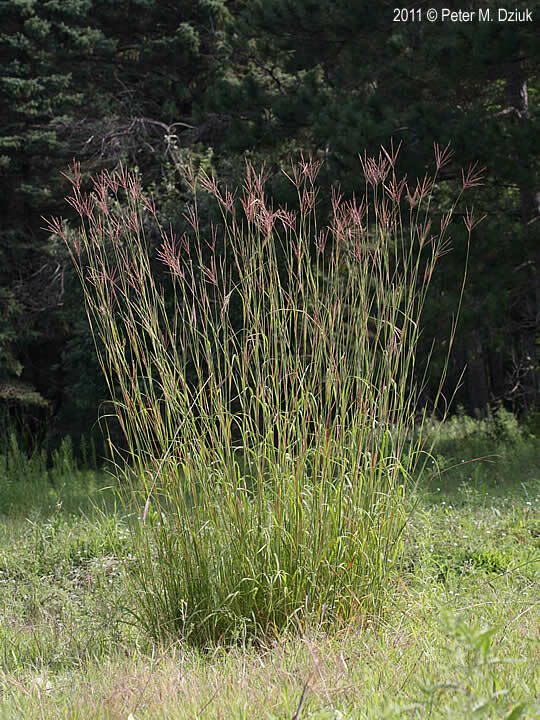 Andropogon gerardii (big bluestem). plants. 2011 © Peter M. Dzuik. Minnesota Wildflowers. minnesotawildflowers.info (Accessed 8/2017). Andropogon gerardii is a perennial C4 grass (Wand et al. 1999), 1-3 m tall, tufted, sometimes with colonial from short rhizomes, stems often waxy blue-green (glaucous) becoming purplish when blooming. Leaves alternate, blade 0.5-1 cm wide, sometimes hairy. 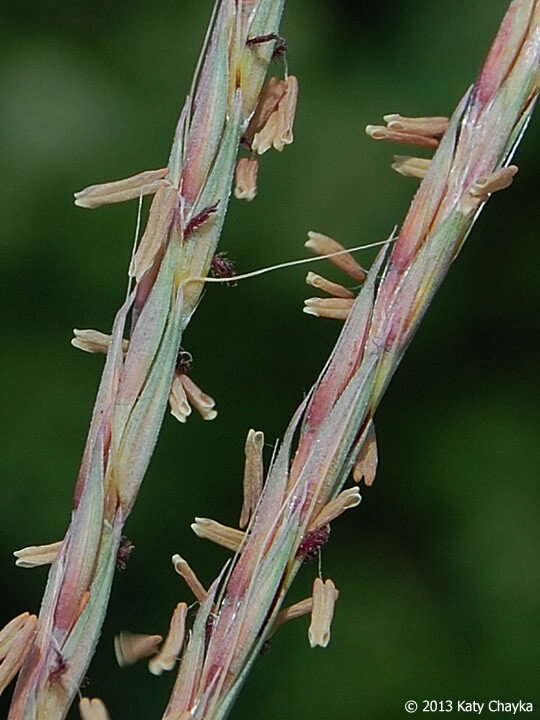 Andropogon gerardii florets. (big-bluestem) . © 2013 Katy Chayka. Minnesota Wildflowers. minnesotawildflowers.info (Accessed 8/2017). Flower spikelets 0.7-1 cm long, awn 0.8-2 cm long; inflorescence of 3-4 branches 5-10 cm long, densely flowered (spike-like), usually purple when blooming, on a long thin stalk at top of stem, very hairy; blooming and fruiting July-Sept.
Habitat: Open areas, prefers soil pH 6-7.5. Tolerant of drought, fire, moderately tolerant of salt, intolerant of shade (USDA, NRCS 2006). Andropogon gerardii (big-bluestem) fruiting spikelets. © 2014 Katy Chayka. Minnesota Wildflowers. minnesotawildflowers.info (Accessed 8/2017). Notes: Planted in grassland restorations. 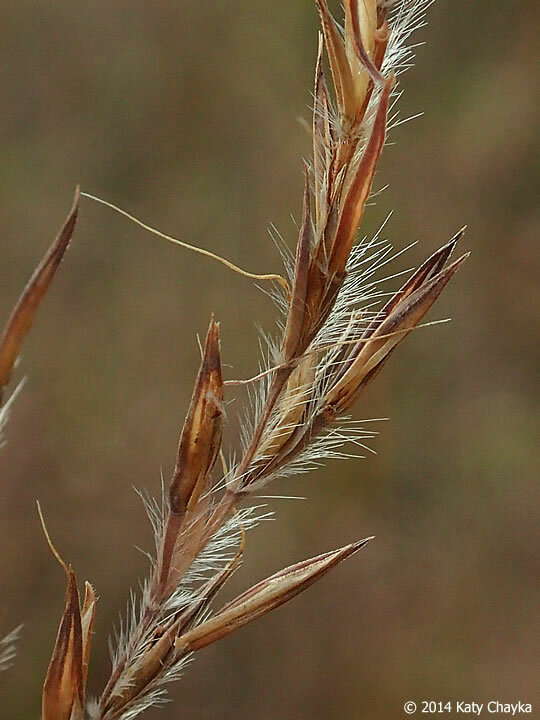 Mainly a tall-grass prairie plant.